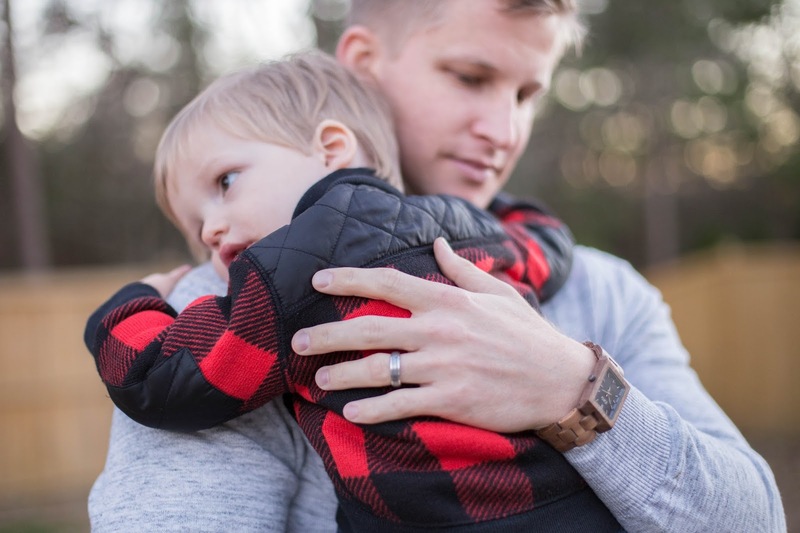 Valentine's Day Ideas for Tired Parents + JORD Giveaway! Disclaimer: This post is sponsored by JORD Wood Watches. As always, all thoughts and opinions are my own! My pre-baby self used to look forward to going out to dinner on Valentine's Day. It was one of the few days a year my husband made the plans, so it didn't matter where we went. I was just happy to get out of picking a place to go. My husband will attest to my indecisiveness! Fast forward a few years and Valentine's Day changed forever with Rowan's entrance into the world just a few days before. I still remember my husband made me take a three-hour nap that day, which was probably the best gift ever at that point. Bless him! This year though, Valentine's Day has been synonymous with "your baby is getting older, cue the ugly tears" for me so there will be no heels or makeup for me! Just sweatpants, lots of cuddles from my littlest Valentine, and an at home date night with my husband. Perfection right there folks! Rowan is usually out by 7:30 which gives my husband and I at least 2 hours before we're ready to crash too, so we've learned to set aside the to-do list and just focus on us. There are so many things you can do but here are a few of our favorites! Make dinner together. It doesn't have to be fancy, our easiest dinners usually involve quesadillas or breakfast foods and eating on the couch. Play 'Heads Up' or a board game. We use the Heads Up app and always have so much fun with it, even with just the two of us. Plus it video tapes each round which you can save and watch later for a good laugh. Go through old photo albums. Pull out the wedding album, baby book, or reminisce on that Europe trip you took in your younger days before the dark eye circles made an appearance. Make a bucket list of places you want to visit, with and without kids. Speaking of traveling, we always get the itch to plan another trip after looking through vacation albums so we end up with a huge list of places we want to see next! Toast marshmallows on an outdoor fire pit. Of course this only works if you aren't dealing with snow or freezing rain in February, but we love using our fire pit here in the South! Exchange gifts. 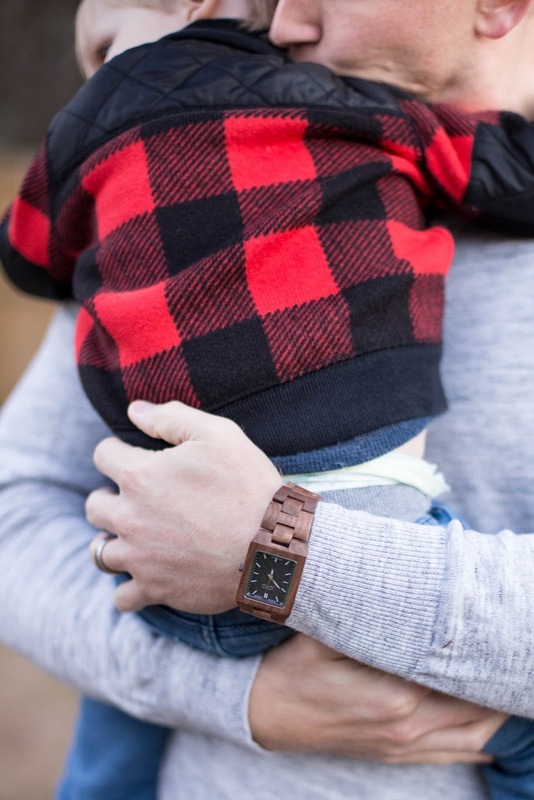 We usually keep Valentine's Day gifts pretty low key, but when JORD reached out to me about their wood watches I thought it would be a unique way to spoil my husband for doing so much for us! I picked the Reece Walnut and Navy watch because the colors match everything in my husband's closet and I loved the modern rectangular shape. I also love the subtle plaid print on the watch face. It is light weight and very smooth to the touch, which my husband tells me makes it so comfortable he almost forgets he is wearing it! 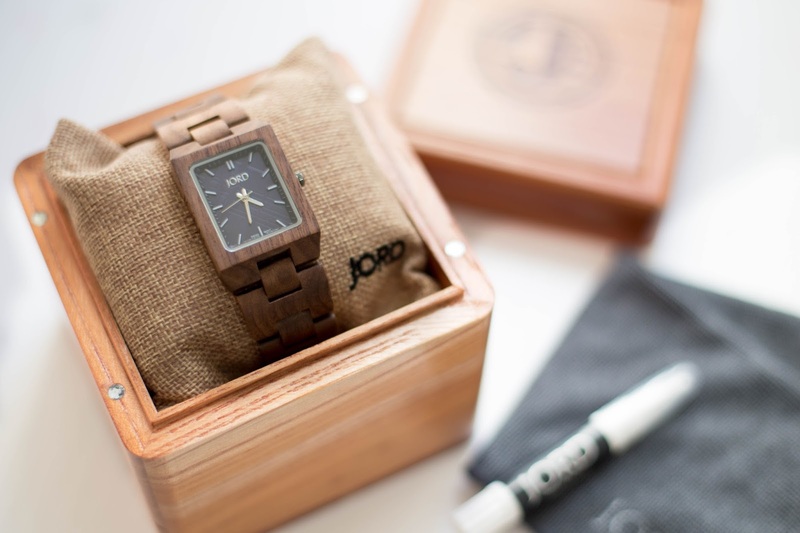 And as a bonus for you guys, I'm excited to team with JORD to offer you a chance to win a $100 credit toward the wood watch of your choice! All you need to enter if your name, email, and favorite watch... super easy! You will receive a $25 credit just for entering! P.S. They have some gorgeous options for women too! Contest ends February 12th at 11:59 PM. Both the $100 and $25 credits will expire on April 30th. Do any of you have at home date nights?! I'd love to hear some of your ideas too! I love the idea of going through old photobooks/wedding video/etc. Since the move, I've been going through a lot of old albums and its incredibly special and moving to look back and see where life has taken us in such a short time. And I love that watch! The wood is unexpected, but cool!